Our northernmost tree house property, with outdoor views of towering spruce. Alaska's Tree house is located two hours south of Anchorage on the eastern Kenai Peninsula. Nestled in two acres of towering spruce and hemlock at the base of the 5,000-foot Chugach Mountains, the Tree house offers lodging with outstanding views of Hearth Mountain and Mount Alice with their hanging glaciers. The Tree house specializes in catering to the adventuresome traveler. Open the year around, Alaska's Treehouse offers spectacular mountain views from both the sun room, where you will enjoy a hearty, gourmet breakfast, and from the large hot tub on the new multi-level deck. Hand-crafted custom woodwork and spacious rooms furnished with antiques and Alaskan art contribute to an inviting, comfortable atmosphere. Stroll the hiking trails that leave from our door and promise sightings of a variety of birds and frequently moose, or relax in the hand-built wood-fired sauna. The "Treehouse" offers you a quiet retreat in the forest, but is only minutes from the tour boats, shops, galleries and restaurants of Seward. A very comfortable, spacious combination of two rooms with their own unique, private entry. Beds that sleep 5 include a queen and twin in one room, and a double in the sitting room, with space for additional twins when needed. A large private bath with hand-tiled shower is accessed from the sitting room. Alaskan art, antiques, books, and nature videos enhance your stay. A serene view into the National Forest which borders our acreage welcomes guests entering this room. A comfortable queen bed, antiques, a library of Alaskan books and videos add to your relaxation. The shared bath is just steps from your door. $15.00 is charged for each additional person over age 5. Longtime Alaskans & active outdoor enthusiasts - hiking, biking, running the local trails, (20 Mt. Marathon races to Al's credit), & kayaking the fjords. Al is a skilled woodcrafter, and Sheila, an organic gardener. Their hiking album, created with great pleasure, will introduce you to most of the trails available in this amazingly rich hiking area. They love to travel, (staying in B&Bs, of course), and are happy to recommend activities and share their knowledge of the Kenai. Smoking is outside only, please. Cash, personal and travelers checks, VISA & Mastercard are accepted. Reduced rates September 15th to May 15th. Check in after 4 PM or earlier by prior arrangement. If the owners are out hiking when you arrive a note on our hand-made message board will help you settle into your room. Bring your swim suits; they're a must for use of the hot tub. The property is located on the east side of the Kenai Peninsula. The 118 mile drive from Anchorage, on the National Scenic Byway, takes about 2 hours and is unsurpassed in beauty - towering mountains, glaciers, wildlife and wild flowers. You're five or ten minutes from Seward, the National Forest is the backyard and tall timber surrounds the uniquely crafted home. 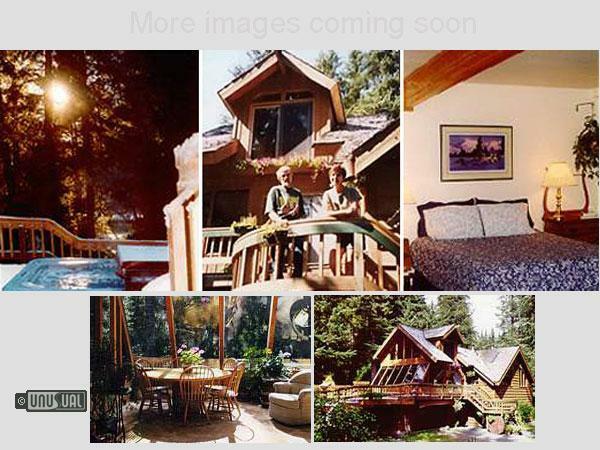 Tucked 1/2 mile off the highway the owners relish our relaxed, quiet setting away from the hubbub of town.